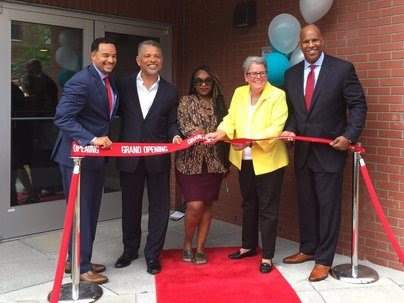 Future Bowen Flats resident Tamekkia Key (center) joins Deputy Mayor Brian Kenner, Adrian Washington of Neighborhood Development Co. (both to her left), DHCD Director Polly Donaldson and DC Housing Finance Agency (DCHFA) Executive Director Todd Lee at June 23 ribbon cutting. 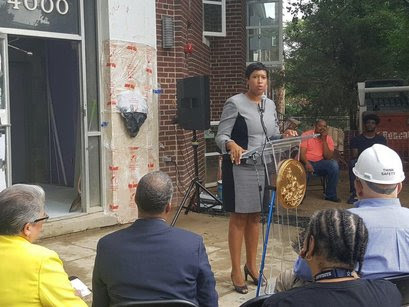 For the second year in a row, Mayor Bowser shown a spotlight on the District’s affordable housing and community development successes, during June Housing Bloom. 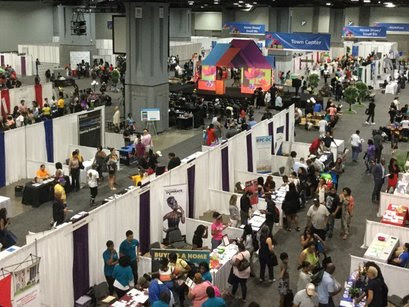 Over 100 events were held by DHCD, other housing agencies and community partners in this month-long celebration. For example, we held a Saturday College on housing rules for landlords, tenants and realtors on June 3. A week later, we sponsored a FamilyFest at Greenleaf Recreation Center in Ward 6, where kids learned about healthy eating tips and persons of all ages received information on District housing, financial and other resources. Toward the end of the month, in addition to the Housing Expo and Scissors and Shovels events discussed below, we also held a hearing on our Annual Action Plan to get community feedback. Mayor Bowser gives remarks at 4000 Kansas Avenue NW groundbreaking. Clauss purchased her first home through the District’s inclusionary zoning Program, which offers eligible households an opportunity to purchase or rent an affordable housing unit through a lottery process. She also was a recipient of down payment and closing cost assistance through the District’s Home Purchase Assistance Program (HPAP). The District’s multi-pronged approach to housing production and preservation, homeownership, and development of vacant properties is winning national recognition. DHCD was announced on April 28 as a finalist for the Urban Land Institute’s Larson Housing Policy Leadership Award. This annual award, provided by ULI’s Terwilliger Center for Housing, recognizes innovative ways the public sector is addressing the nation’s affordable housing crisis. The winner will be announced in September. The Washington Business Journal honored The Beacon Center, a 99-unit mixed-use project at 6100 Georgia Avenue NW, and the John and Jill Ker Conway Residence, a 124-unit project at 1005 North Capitol Street NE, as standouts for the best 25 real estate deals for 2016. The Conway Residence also received the 2017 Urban Land Institute’s (ULI) Washington TRENDS Award for Excellence in Housing Development. The Girard Street Senior Apartments was awarded best small affordable housing project by the Housing Association of Nonprofit Developers. On a related note, Director Donaldson was honored to represent the District during the Daniel Rose Fellowship study tour of Seattle and Alaska this spring. Six District-owned properties in Historic Anacostia were awarded to Mi Casa and Development Corporation of Columbia Heights to produce family-style affordable housing units. Flywheel Development LLC and Neighborhood Development Company will construct 40 new townhomes on vacant property in Wards 7 and 8. HPTF financing will preserve affordable rental units in Wards 1 and 8: (1) So Others Might Eat (SOME) will be able to provide supportive services for 36 families thanks to $4.9 million in HPTF financing that will preserve rental housing in Ward 1; and (2) the United 2nd Street Tenants Association and Mi Casa received $2.6 million in HPTF funding under the Tenant Opportunity to Purchase Act (TOPA) to acquire and preserve 25 rental units in Ward 8. Over $5 million in HPTF funding will help preserve nearly 100 affordable housing units in Wards 5 and 7: (1) Housing Up received funding to rehabilitate Hedin House, a 48-unit apartment building in Ward 5; and (2) Residence at Minnesota Gardens Cooperative Inc. received funding for the acquisition and preservation of 48 affordable housing units in Ward 7. And more is to come. Our Spring 2017 funding notice and request for proposals (RFP) recently closed and proposals that will produce and preserve more affordable housing units are now being evaluated.